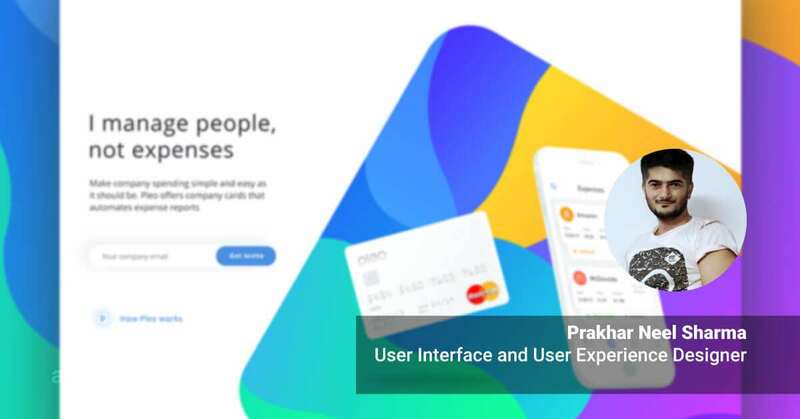 I am Prakhar Neel Sharma working as User Interface and User Experience Designer for the past 4+years. I specialize in creating engaging digital interfaces designed around the end user. For last 1 year I was working with a Denmark based corporate credit card company named Pleo which I left on 2 August 2017. After arriving from Denmark, currently, I am working as a freelancer designer and enjoying my stay at the most beautiful place, Dhar. Some of my works can be seen here: Collectui, Behance. Who is a UI/UX Designer? I think anyone can be a UI/UX designer. We all can see the world from our own perspective. We are all designers. It’s just some people go in depth of what actually other people like as a user in digital products. It is challenging yet fun to do. 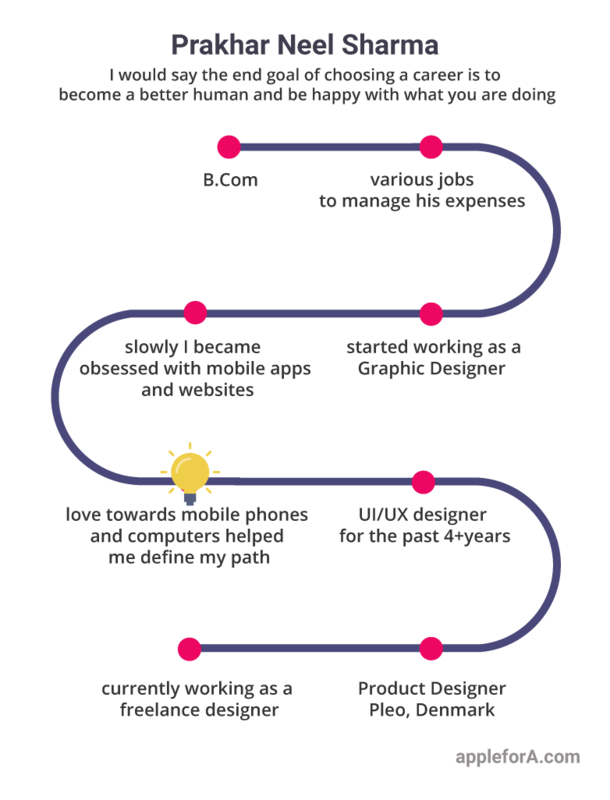 Why did you choose to be a UI/UX Designer? Honestly, I never thought of being a Designer. During school days I was not interested in studying because it wasn’t fun for me. I had no idea what I was learning and where I am going to use it. We have been living in a society where the salary figures are more important than passion. I am really fortunate to have such good parents. I never got any pressure for job, salary or education. So I did my 12th (with PCM) class with 52%, somehow managed to pass. 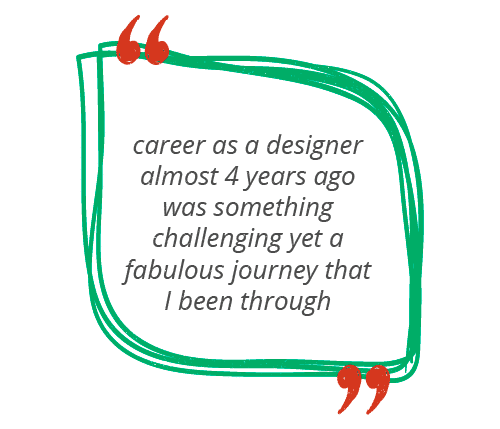 I had no ambition, path or direction about my career or future. From very early age I really enjoy mobile phones and computers, that is the only reason I am here. I think the best way to find out what interests you are tryouts. My sole purpose as a designer and as a human is to make people’s lives better and easier. I want to use my expertise to solve real-life problems and create a bridge between humans and machines to utilize each other’s full potential. We are surrounded by digital products which testify lack of care and intricate details, this drives me to work on a better and thoughtful solution. Being 18 years old was fun, living life without any plans was the best part. But now I am a bit serious about my work because with the skills and experience, comes a sense of responsibility to utilize it in the best way possible for people. My day is pretty simple and easy to live. I enjoy creative freedom as a freelance UI/UX designer. So there is usually no pressure of deadline which gives me enough time to think. I enjoy research-based work, so I usually pick projects where I could learn from people I am working with and give my best to deliver the quality work to clients. Pencil, paper, eraser, ruler, macbook and iPhone has been my best companions. After that, I prefer to work on softwares like Photoshop, Sketch, Illustrator, etc., to give wings to my dream. I like to design from logo to the whole project. Therefore, my role depends on the projects. 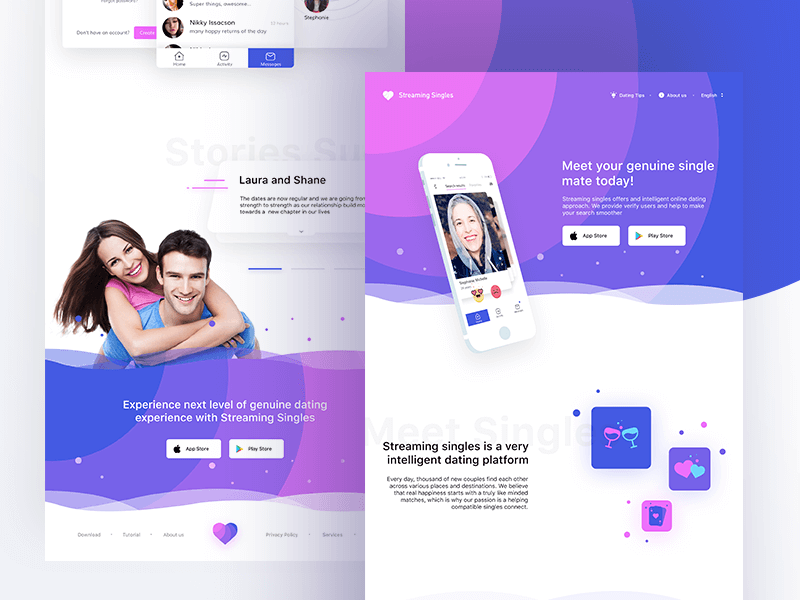 Sometimes I work on the whole app, while sometimes creating a feel of the predefined app or website, so it depends upon client requirement and level of innovation required. I would say Design portals like Behance and social networks like Linkedin. The most important thing I learned as a designer is to create your online brand or portfolio so that clients will find you based on your work. From the beginning of my career, I always rush behind improvements. And I am still running to improve myself. I always put money as my second priority. I think heuristic study or self study serves the most important part in preparing for a designer role. Sometimes I need to deliver the output within a time limit is a bit challenging part, because for me it’s a bit difficult to compromise the work quality in the pressure of time. So keeping both time and work quality balance is challenging. Apart from this, I never cared about pay, future, scope, demand, etc. Because, if your work speaks your name then you never have to care about anything. What type of UI/UX Designer will be high in demand in the near future? Future is a manifestation of dreams. It’s not about demand, it’s about what you want to do with yourself. +2 – PCM, Kendra Vidyalaya, Dhar. (Besides worked in a mobile hardware shop, call center (domestic and international), salesperson in Samsung showroom, etc., to manage my expenses). Later started working as a Graphic Designer in a private firm again to manage some expenses. And slowly I became obsessed with mobile apps and website that turned me into UI/UX designer (Love towards mobile phones and computers helped me define my path). User Interface and User experience designer for the past 4+years. Last 1 year – Denmark based corporate credit card company, Pleo . Currently – Working as a freelancer designer. I learned mostly from people around me, self study, contemplating talented people, sharing their incredible efforts online and of course failures. What are the skills required to be an UI/UX Designer in 2020? 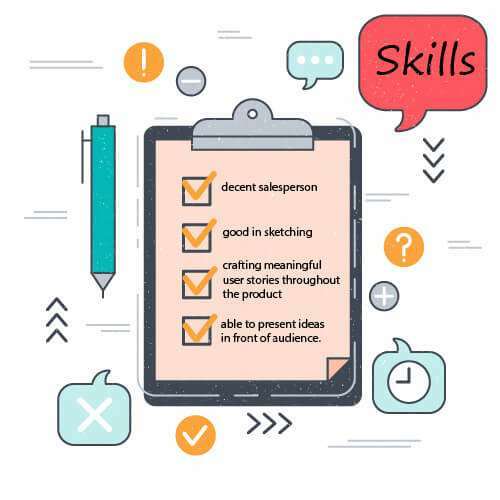 As a designer in 2020 you need to be a decent salesperson, good in sketching, crafting meaningful user stories throughout the product and be able to present ideas in front of audience. The degree is not required to be a UI/UX designer. It merely depends upon your interest and the kind of efforts you are eager to put on the desk. I myself doesn’t hold any relevant degree. Establishing yourself as a brand in this field is the key to success. Clients enchant your name not because they know you, but more importantly because of the work you are producing for them. Like I mentioned many times self study and getting inspired by people is the most important thing, apart from that having a good grip on softwares and sketching is nice to have. Apart from this preparing for admission in prestigious exams like NID, CEED would be helpful to establish yourself as a designer. I am really a big big fan of designers like Marc Newson, Tobias Van Schneider, Mike Smith (Creative mint), Steve Wolf, Ryan Putnam, Nick Kumbari, Dann Petty, Eddie Lobanovskiy and the list is endless. I like to see their real-time work and take myself to their design world. Apart from staring these folks, I enjoy spending my time with family and friends, unexpected movie plans especially in horror genre, enjoy playing gali cricket with Sonu (my childhood friend). I enjoy small moments of happiness and never like to wait for big one. I am happy to be surrounded by such good folks. What are some alternate career options for an UI/UX Designer? Illustrator, logo designer, and icon designer are valuable alternate career options for a creative person. What do you think potential recruiters look for in a fresh UI/ UX Designer? able to demonstrate presentation skills, etc. Any recommended resources for students who are interested in your area of work? What do you think everyone leaving higher secondary school should know especially those who want to be in your area of work? I am a designer not by education, but by experience and practical knowledge, and yes education plays an important role to make students ready for future endeavours. Preparing for NID and CEED are also a very nice option to be a well-crafted designer. I really wanted to pursue designing from NID, but I was not qualified for it. So for students who aspire to be a designer could prepare from 10th grade to increase the chances of admission. It’s a tough examination, so preparation is very important. Here you can get more info about NID and CEED. What is the role of parents in students career choice? I think the answer is to understand their child as a friend, gauge their caliber and support them in their decision with no comparison to others is the best way to flourish their career. I am really fortunate to have such supportive parents, sisters, brothers and Neelesh (my dearest friend, brother, roommate…). I would say the end goal of choosing a career is to become a better human and be happy with what you are doing. 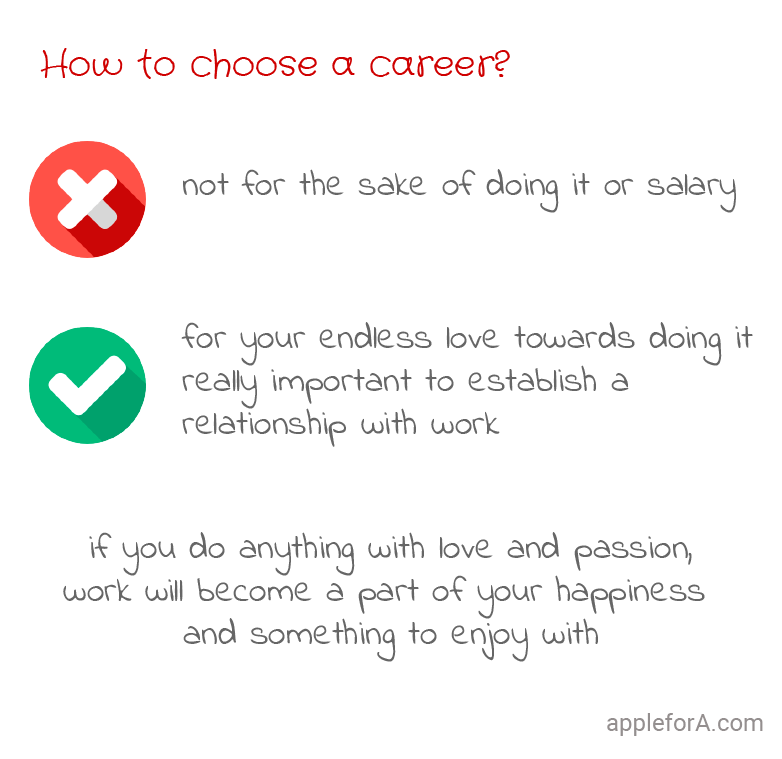 So, if you do anything with love and passion, work will become a part of your happiness and something to enjoy with. It’s really important to establish a relationship with work, not for the sake of doing it or salary or whatever, but more for your endless love towards doing it. Note: My career story is different from other people. I am sure students would get positive learning about choosing their career path. Still in current scenario, people want their children to be engineers or doctors, so in that system starting a career as a designer almost 4 years ago was something challenging yet a fabulous journey that I been through. I really want students to choose profession not for the sake of money but for their actual love towards doing something. And I followed the same path. Interested to become an Interaction Designer? Join now and earn 3 months of free membership at the Interaction Design Foundation.